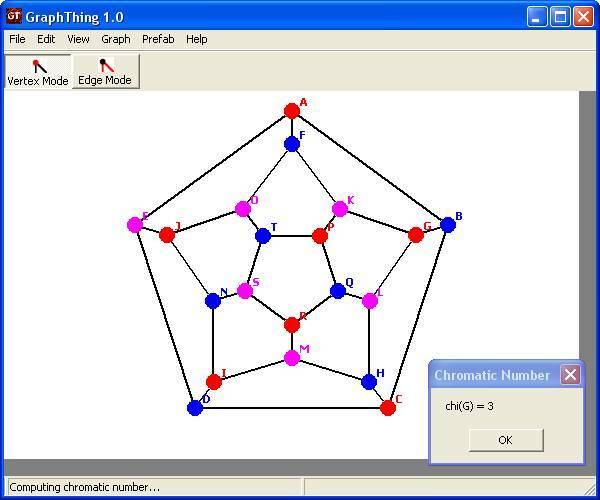 GraphThing is a tool that allows you to create, manipulate and study graphs. These "graphs" are mathematical objects (look at this introduction to Graph Theory) that describe relationships between sets; they are not 2D plots, charts, or anything similar to that. If the image on the right means nothing to you, you're probably at the wrong place. 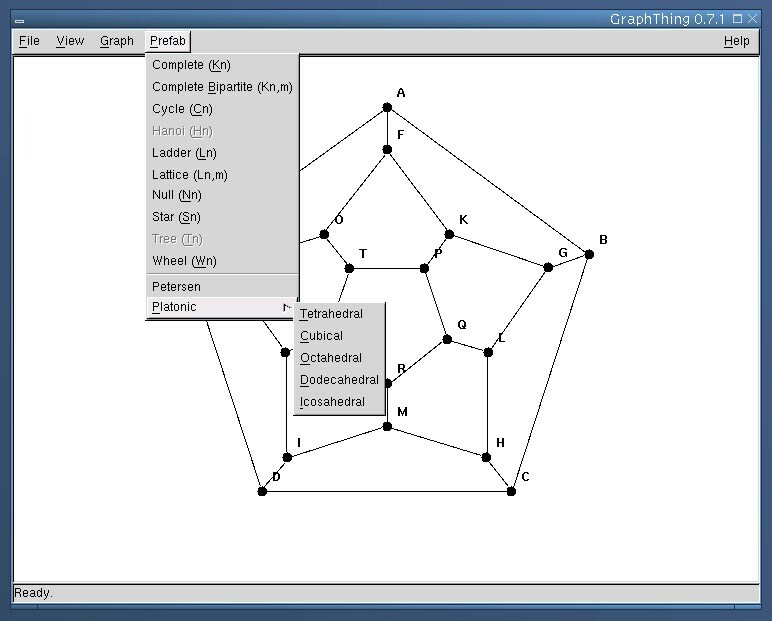 GraphThing is Free Software, licensed under the terms of the GNU GPL. That means that not only does it cost you nothing, but you also have the freedom to redistribute it or modify it however you please, so long as you also give these freedoms to others. As an example, the CityBuilder project has taken a particular version of GraphThing, and modified it for their own needs. They have released the source code to their forked version under the GNU GPL. 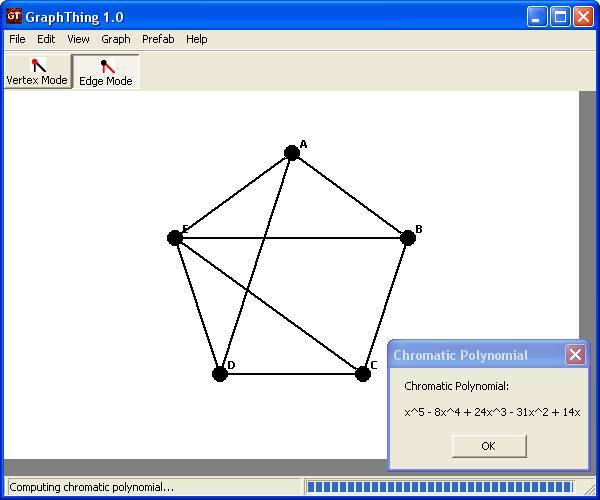 If you find GraphThing useful, especially in either an educational or academic setting, please email me and tell me your thoughts about it! 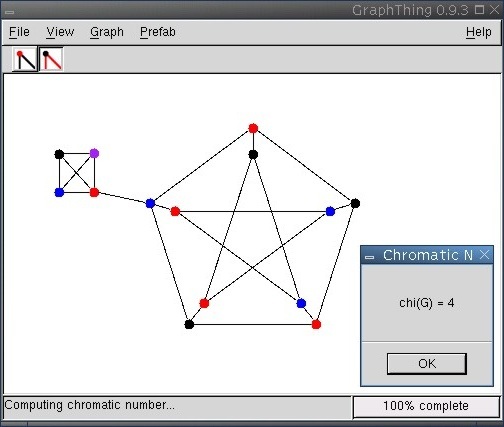 GraphThing 1.3.2 is out. This is a small update to include the new Chinese (Simplified) translation, courtesy of Guo Yixuan. Cyril Brulebois has managed to get GraphThing into Debian ( see his blog entry)! Within a short amount of time it should enter the current official unstable Debian distribution ("sid"), and hopefully even the new upcoming stable release ("etch")! Great news for all Debian users out there! Congratulations to Cyril Brulebois for getting his first upload into Debian! 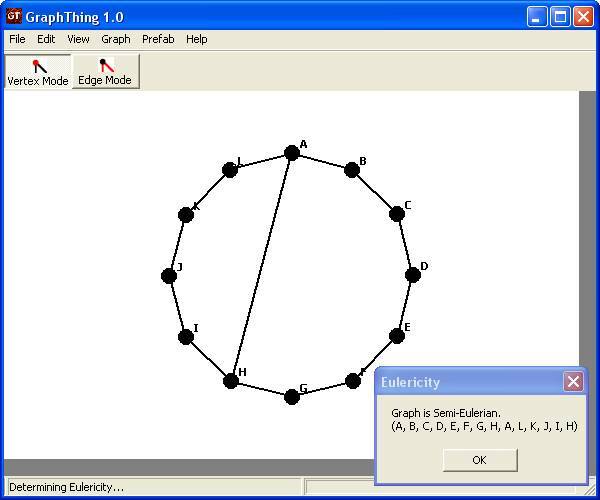 13th October 2006 - Update: GraphThing has now entered the current testing distribution ("etch"). GraphThing 1.3.1 is out. This is a maintenance release, fixing up some of the build process and rolling in some 64-bit fixes and a new manpage. If you're not having any problems, don't bother upgrading. Packages for this release will follow shortly. After a long hiatus, I'm pushing out version 1.3 of GraphThing. It's not a big revision over the previous version, but it needs releasing. Version 1.2.1 of GraphThing is available; it is a bug-fix release, exclusively for some problems writing vertex labels to files. If you know that this is not happening, this release is not for you. Version 1.2 of GraphThing is out now! Changes are mainly for multilingual support, so if you only use it in English, and you haven't had any problems compiling it, you don't need to upgrade from 1.1 to this version. Adding, deleting and moving of vertices and edges. Loading and saving of graphs. Graph complements, induced subgraphs and line graphs. Quick creation of many common graphs (complete, cycle, null, star, etc.). Determination of shortest path, connectivity and Eulericity. BFS, DFS and Minimum Spanning Tree. Adjacency matrix (including exponents) and degree sequence. Chromatic polynomial and chromatic number. Network algorithms: Maximum network flow. GraphThing runs natively with English messages. The latest version of GraphThing has support for the following languages. If you would like to have GraphThing in your native language, and can help by translating, please get in contact with me! It is reported that there are several problems with accented characters under the GTK port of wxWidgets. This usually happens with non-Unicode builds of wxWidgets, and can be remedied by either compiling GraphThing against a Unicode build of wxWidgets, or using a language code of something like 'fr_FR.UTF-8' (in the case of French). The way to specify which language to use is operating system-dependent, but it comes down to setting the LANGUAGE environment variable to the language code (see the table above) of your choice. Microsoft Windows users should follow these instructions for Windows XP, or these instructions for Windows 2000. You can either compile GraphThing yourself, or download a pre-made binary. Mac OS X users can use the wxmac package through Fink. FreeBSD users should install x11-toolkits/wxgtk26 in the ports collection. Debian users need the libwxgtk2.6-dev package from the testing distribution. Gentoo users want wxGTK in x11-libs in portage. FreeBSD: Use the x11-toolkits/wxgtk26-unicode port instead. FreeBSD: The Ports collection has GraphThing 1.3.2 in CVS. Debian: Cyril Brulebois maintains GraphThing as an official Debian package, currently at version 1.3.2. Ubuntu: GraphThing 1.3.1 is in the universe section of Feisty Fawn (the current development version, 7.04). There's also an unofficial package of 1.3.2 over at GetDeb.net for Dapper and Edgy. There is a mailing list for GraphThing, open to everyone who wishes to discuss GraphThing. Feature requests, bug reports, general complaints and praise are all welcome, though you must be subscribed to the list to be able to post. The list archives are also available.